A number of staff changes will be taking place at the Illinois Association of School Boards (IASB) as the Association enters a new fiscal year July 1, and upon retirements of key executives. Earlier this year the IASB board of directors selected Thomas Bertrand, superintendent of Rochester CUSD 3A, to replace outgoing Executive Director Roger Eddy. Bertrand will officially take over executive duties on July 1. Also previously announced, longtime Associate Executive Director of Field Services and Policy Services, Cathy Talbert will be retiring at the end of the fiscal year (June 30). With Talbert departing, realignment among staff is set to take place. Current Associate Executive Director Dean Langdon will be in charge of the new Member Services department, which includes Board Development and Field Services staff. Policy Services will merge under the umbrella of the Office of General Counsel, led by current IASB General Counsel Kimberly Small. Policy Consultants Brian Zumpf (Lombard office) and Angie Powell (Springfield office) will be promoted to directors and take on additional responsibilities. Within Member Services, Peggy Goone will move from administrative assistant to assistant manager; Reatha Owen will be senior director while also retaining her field services duties for the Blackhawk, Central Illinois Valley, Corn Belt, and Western divisions; and Patrick Rice, field services director for the Egyptian, Illini, Shawnee, and Wabash Valley divisions, will take on additional responsibilities under the newly created position of equity director. This summer the Association also welcomes three new staff members. Joining Field Services in the Lombard office is Gretchen Baumann, administrative assistant. Baumann, who started with IASB on May 21, works with Perry Hill, field services director for the South Cook, West Cook, and Three Rivers divisions. 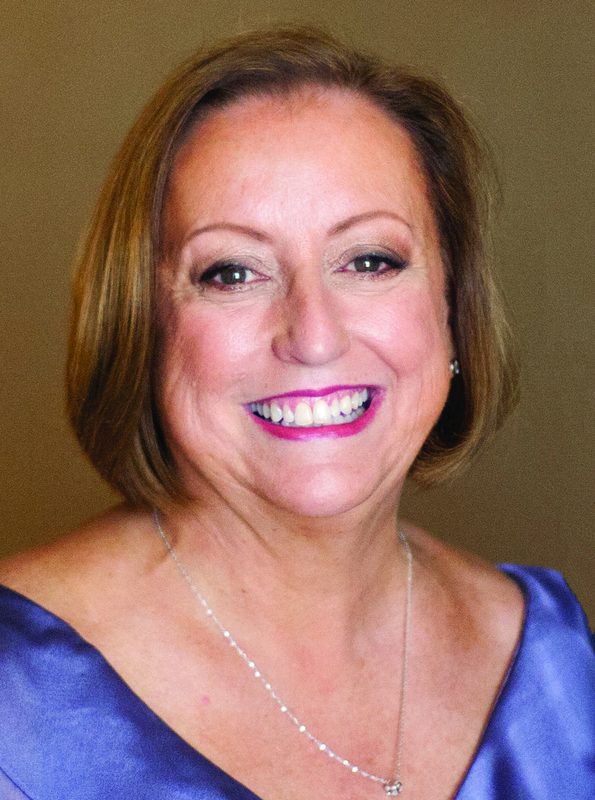 Prior to her time with the Association, Baumann was the administrative assistant and billing specialist for All Access Logistics in Glendale Heights. Filling the open position of assistant director, Governmental Relations will be Ronald Madlock. Madlock previously taught math and science at schools in the metro east area and in Chicago. He has a juris doctor degree from Washington School of Law, and for the past two years has worked in Washington D.C. on the staffs of the U.S. Senate and House of Representatives. Madlock will begin with the Association on July 2. 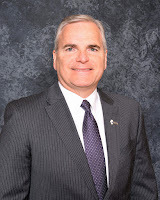 Tim Buss, superintendent of Wabash CUSD 348, will be joining IASB staff as a part-time consultant in the Executive Searches Department on July 2. Buss received his Masters of Science in Education Administration from Eastern Illinois University. He has served Wabash CUSD 348 since 1985, working in the positions of teacher, coach, athletic director, assistant principal, principal, and as superintendent for the past 14 years. Buss will officially retire from the district on June 30. Other staff recognitions include Heath Hendren promoted to director, editorial services for Communications, and Lin Bremer, administrative assistant in the Policy Services department, will retire on August 1 after 16 years of dedicated service to IASB. A full listing of all IASB staff members and their respective departments is available on the Association’s website. The Illinois General Assembly, Thursday, sent legislation that would mandatorily increase teacher salaries to Governor Bruce Rauner for his consideration. SB 2892 (Manar, D-Bunker Hill) was approved by both the House of Representatives and Senate by narrow vote margins at the end of May. The governor has 60 days to take action on the bill, either by signing it into law or issuing a full or partial veto. School board members, superintendents, principals, and business officials are urged to contact the governor and ask for a veto of the legislation. The contact information for the governor is here. The Alliance also sent a letter urging a veto. School district leaders should provide specifics as to how such a new, unfunded mandate would affect their district budgets, staffing, and operations. The bill further adds that for each school year thereafter, an automatic salary increase would be required, including the minimum salary rate for the previous school year increased by the Consumer Price Index. Illinois has a collective bargaining law that empowers local school boards, together with their teachers and support staff, to set salaries in consideration of the revenues available. School leaders and staff must take into consideration all aspects of its budget, consider other benefits (i.e. insurance premiums and pension contributions) besides salary, and make very difficult decisions to provide an effective education program that meets the needs of all students. Local school districts not only would be liable for the new minimum salary, but would have increasing costs due to the inevitable ripple effect this proposal would have throughout the teacher salary schedule. Unintended consequences such as fewer teachers, higher class sizes, and educational program cuts would be likely in many school districts. 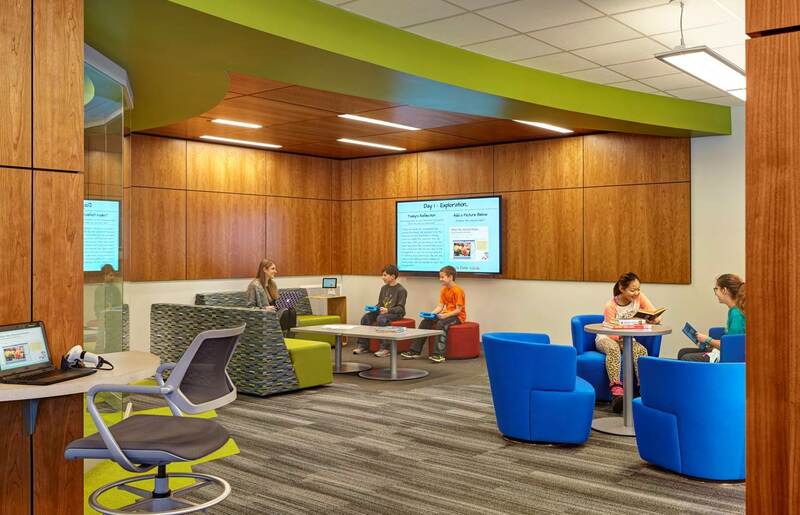 Well-designed school facilities are eligible for the awards. The annual Exhibition of Educational Environments, sponsored by the IASB Service Associates, is now accepting nominations for outstanding school design projects. The competition is seeking school facility projects that will be completed in time for the start of the 2018-2019 school year. Three architects chosen by the Service Associates, and three school board members or administrators selected by IASB, will comprise the jury and review the entries on a blind basis. Projects selected for the final exhibition will be displayed in November at the Joint Annual Conference in Chicago. Those reviewing the projects will have complete freedom in selecting entries that best represent a statewide cross section of school building designs that are of interest to exhibition attendees. The jury will give prime consideration to solutions of the stated educational program requirements as detailed in the Call for Entries application form. Completed forms and associated fees for each project must be received in the IASB Springfield office by July 16. Additional preliminary materials are due by September 3, with the jury meeting to judge submissions on September 14. Applications were mailed to district superintendents, regional superintendents, and school architects in early May. A fillable application with detailed instructions is also available on the IASB website. School designs selected for the exhibition will be eligible for Award of Distinction, Award of Merit, or Honorable Mention honors. The winners will be recognized during the First General Session on Friday, Nov. 16. 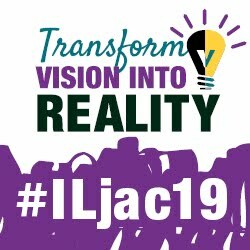 For more information about the Exhibition of Educational Environments or questions about the contest, contact Jennifer Nelson by email at jnelson@iasb.com, or by phone at 217/528-9688, ext. 1105. Nominated exhibits from previous contests can be viewed and accessed through IASB’s School Design Data File. IASB offices in Springfield and Lombard will be closed on four days in July in observance of the Association’s summer schedule and a national holiday. Both offices will be closed for the national holiday Wednesday, July 4, as well as on Thursday, July 5, and Friday, July 6. The offices also will be closed the following Friday, July 13, for IASB’s summer schedule. IASB is reporting historically high membership numbers at the close of the 2018 fiscal year. With the addition this year of Edwardsville CUSD 7, located in IASB’s Southwestern Division, 846 school districts are dues-paying members of the Association. There are just four non-member districts in the state. The current 99.5 percent membership ratio is the highest in IASB’s 105-year history. IASB is reminding member school districts to update their Association membership information. Member district listings are shown on IASB’s member database, and any corrections or new member updates can be made to the district roster on the member database. Those making the roster updates can follow the step-by-step instructions and a quick video that walks users through the process. Other member database instructions are also posted to assist board members, superintendents, and PRESS subscribers in using the system to its full potential. 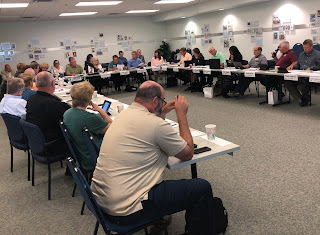 The IASB Board of Directors met June 15-16 at the Association office in Springfield to conduct its annual board self-evaluation, review and approve monitoring reports, and approve the FY19 budget. The board also approved two firms for invitation to membership as IASB Service Associates, DecisionInsite, LLC and RoomReady. The board heard reports on governmental relations, the 2018 Conference, and an IHSA update among others. They also approved the contract for incoming executive director Thomas Bertrand. The next quarterly Board of Directors meeting is scheduled for August 24-25 in Effingham. A pair of two-day Student Behavioral Threat Assessment Workshops will be offered in two separate locations next month. The workshops are provided at no cost by the Illinois School and Campus Safety Program. Presented by Sigma Threat Management Associates, the workshops aim to help participants understand the dynamics of targeted violence and to develop and enhance strategies for early identification, assessment, and intervention with potential dangerous situations. School administrators, board members, counselors, school resource officers, mental health agencies, and local law enforcement personnel are encouraged to attend. The Illinois School and Campus Safety Program provides awareness and preparedness training to enhance organizational capacity to plan for, respond to, and recover from an emergency or disaster. The program is administered by the Illinois Law Enforcement Training and Standards Board Executive Institute at Western Illinois University. The U.S. Department of Justice, Office of Justice Programs, and Bureau of Justice Assistance (BJA), recently published two notices for competitive grant programs for the recently approved STOP School Violence Act. Eligible applicants are limited to states, units of local government, and federally recognized Indian tribes. School districts interested in these funds should work with their counties and municipalities to apply. IASB will encourage the state to apply as well. Funds available for this grant program may be used to address the development and operation of school threat assessment and crisis intervention teams, and the development of technology for local or regional anonymous reporting systems. Applications for grants are due July 23, 2018. Further information about the grant program is available here. Funds available for this grant program may be used to address training school personnel and educating students to prevent student violence, and training school officials in responding to related mental health crises. Grant applications are due July 23, 2018. Further information about the program is available here. As part of the Evidence-Based Funding (EBF) law passed in August 2017, the Illinois State Board of Education needs to notify school districts of the total English Learner (EL) funding generated by each school district’s students. ISBE has completed the calculations for all school districts’ FY 2018 EL funding totals. District funding attributable to ELs needs to be spent on EL services according to the requirements of Article 14C of the School Code, as well as Part 228 of the Administrative Code. Districts need to submit an expenditure report through the period ending June 30 about all funding received under EBF in FY 2018 to show how EL funds were spent for the year. ISBE expects districts to enter their June 30 reports in the Electronic Expenditure Reporting System under revenue code 3305 and program name “Bilingual Ed. – TPE and TPI.” Reports will be due on or before July 20. Any EL funds not spent this initial year will be observed as carryover funding for FY 2019, according to ISBE, but must remain for exclusive use to support EL services, and districts should plan to spend any carryover funds in FY 2019. The EBF law requires ISBE to calculate the total special education funding generated for each organizational and specially funded unit. This amount includes any special education funds generated under the Base Funding Minimum and Tier Funding. ISBE reports it has completed the FY 2018 special education funding totals. By law, all units of participating districts, and all specially funded units, must use their special ed funding to provide special educational facilities and services as defined in Section 14-1.08 of the School Code. Each unit of a participating district is required to describe how it will use the Base Funding Minimum and Tier Funding it receives with specific identification of how they intend to use low-income resources. ISBE has completed the calculations of the low-income resources for FY 2018 EBF distributions. Local Education Agencies (LEAs) don’t need to submit expenditure reports to ISBE for any low-income funds generated under the Base Funding Minimum and Tier Funding computed under EBF. Questions about Evidence-Based Funding allocations should be submitted to ebfhelp@isbe.net. Twenty-nine panels have been chosen among the 67 proposals submitted by school districts and related educational organizations to present at the 2018 Joint Annual Conference. 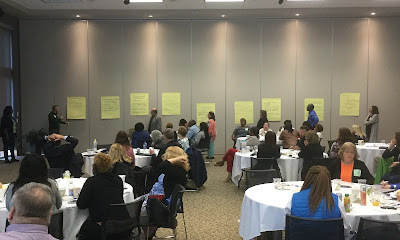 A volunteer committee of school board members from throughout the state reviewed the winning proposals for hour-long “Share the Success” presentations set for Nov. 16-18 in Chicago. Click here to see an entire list of 2018 Share the Success panels. For the first time, panel proposals were evaluated entirely online by committee members. “The entire panel evaluation process was moved online this year, making it easier for the board member volunteers to evaluate the panels. We invite them to be part of the review process and they — independently and individually — rate the proposals,” said Nesa Brauer, an IASB consultant who assists the committee by organizing the selection process. A full description of all Conference panels and other programing will be available in the Conference Preview, which will be posted on the Conference website in September. Online Conference registration and housing will open on Monday, June 11. This year, board members will also be able to register for Pre-Conference Workshops at the same time. The 2018 event will be the 86th Joint Annual Conference with the Illinois Association of School Administrators (IASA) and Illinois Association of School Business Officials (Illinois ASBO). 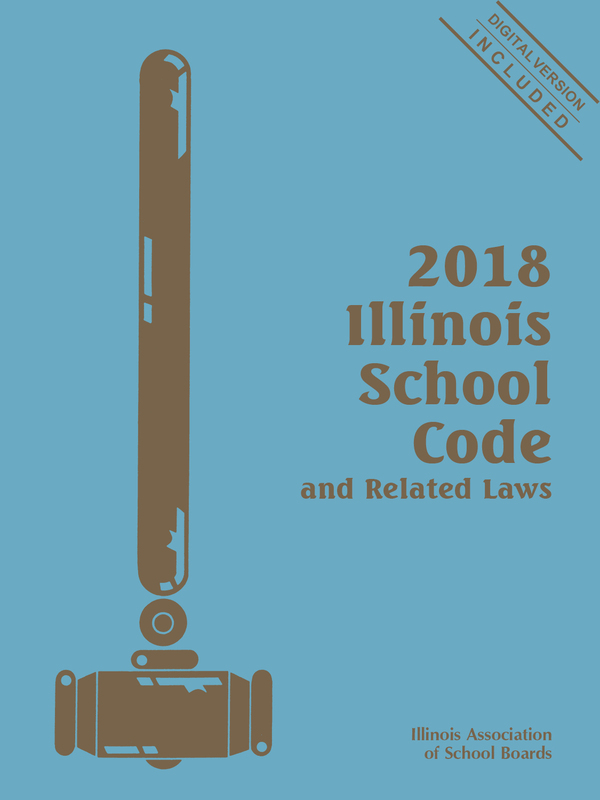 IASB is now accepting orders for the 2018-2019 Illinois School Code Service. 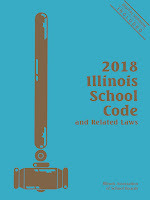 The newest edition is once again offered in a package that includes both the 2018 Illinois School Code and Related Laws and next year’s 2019 Supplement. The Code is available in print with a digital version included at no extra cost. The digital version carries the full text of the Code, plus annotations with case law and other references, all State Board of Education rules and the text of court cases cited in the annotations. Current through all of the 2017 legislative session (including December), the 2018 Code also carries a large number of additional statutes pertinent to the public schools, including selected election laws and pension laws, Educational Labor Relations Act, Open Meetings Act, Freedom of Information Act, Disclosure of Economic Interests, Truth in Taxation Act, Local Records Act, Personnel Record Review Act, Prevailing Wage Act, Emancipation of Mature Minors Act, Tort Immunity Act, Gift Ban Act, and School Visitation Rights Act. The 2018 Code will be shipped upon receipt of order, and the 2019 printed Supplement will be automatically shipped to customers when it becomes available in May 2019. This service eliminates the need to place a second order for the Supplement and saves districts time in receiving the updated information. The regular price for the 2018-2019 Illinois School Code Service is $65 each, while the price for IASB member districts is $55, plus $7 per order for shipping within the continental U.S. Orders in increments of six will receive a $30 discount. Order online at the IASB Bookstore, or call 217/528-9688, ext. 1108. Governor Bruce Rauner signed the Fiscal Year 2019 state budget into law on Monday. In a rare display of bipartisanship, the Illinois General Assembly approved a full year state budget – balanced and on time – on May 31. Details of the spending plan were contained in the last Alliance Legislative Report. Surrounded by legislators from both parties and from both chambers, the governor presided over a bill signing ceremony in the James R. Thompson Center in downtown Chicago. Lawmakers are not slated to return to the Capitol until after the General Election in November. HB 109, the appropriations bill, is now Public Act 100-0586. HB 3342, the Budget Implementation Bill, is now Public Act 100-0587. They became effective upon the governor’s signature. A provision in Public Act 100-0465, which contained the new Evidence-Based Funding formula, provided for the creation of the Tax Increment Financing (TIF) Reform Task Force. The Task Force was charged with reviewing the benefits and costs of TIF districts, the interaction between TIF law and school funding, the expenditure of TIF funds, and the expenditure of TIF surplus funds. The Task Force held meetings in which representatives from local governments, education, private industry, nonprofit entities, and the economic development community provided testimony. The full Task Force Report can be viewed here. The Illinois Statewide School Management Alliance and other school district organizations formed a working group to explore legislative changes to the TIF law. The Alliance gives special thanks to Ryan Linnig, superintendent/principal, Dimmick CCSD 175; and John Izzo, attorney, Hauser, Izzo, Petrarca, Gleason & Stillman, LLC, for taking time to present the group’s recommendations to the Task Force members in Springfield in April. The Alliance will continue to pursue changes to the TIF law reflecting these and other TIF issues as they emerge. The working group’s recommendations to the Task Force can be reviewed on the IASB website. Click here to read the entire Alliance Legislative Report 100-72, including information on upcoming threat assessment workshops and the IASB resolutions deadline. Registration for the 86th Joint Annual Conference, November 16-18 in Chicago, will open on Monday, June 11, at 8 a.m.
Public school leaders are invited to “share the vision” at the premier state education conference, presented by the Illinois Association of School Boards, Illinois Association of School Administrators, and Illinois Association of School Business Officials. School districts can register for the 2018 Conference online by selecting “My Account” at www.iasb.com. Individuals not listed in the IASB member database cannot register for events, so it is important that school district rosters are up-to-date before registration. Roster management instructions are located at iasb.com/services/ams.cfm. Additional registration information was sent via email on June 5. Conference announcements and updates are available at www.iasb.com/jac18/. The following are editorials, commentaries, and opinions from various sources regarding public education, collected in April and May 2018. The views and opinions of authors expressed below do not necessarily state or reflect those of the Illinois Association of School Boards. The appearance of external links does not constitute endorsement by the Illinois Association of School Boards of the linked web sites. All links are provided with the intent of informing readership of issues relating to public education in Illinois.